As I go on this fun, winding journey of turning my house into my home I learn a lot of important lessons along the way. Things like always check to see if you need a permit before you change something big in your house, always test samples of paint on the wall before choosing so you don’t have to paint the room seventeen times, and never assume that a project will be quick and easy because that assumption will ensure that it is loooooooong and haaaaaaaard. Those are some important life lessons right there. One thing that has taken me a little longer to learn has been the value and importance of creating mood boards for a room. It’s something I didn’t do for the longest time, but I recently discovered how huge of a difference it makes when I’m planning out a room and now I kind of want to shout about it from the rooftops. I know mood boards might seem like something only bloggers and interior designers do, but they don’t have to be. Really, they shouldn’t be. Mood boards are a tool that can totally change the decorating game in your house, and so I thought today I’d spend a few minutes teaching you my process for making them and talk about why the heck I think they’re so dang important. First of all, let’s chat about why in the world you should create a mood board in the first place. I’ll admit, there was a long time where I really didn’t see the value in them. I’m pretty good at visualizing projects and plans in my head, and I generally don’t have an issue planning out a room from start to finish without ever compiling things in a mood board. However, over time I started to run into a few of the same issues over and over that helped me understand that maybe mood boards are the way to go. First of all, some rooms are just hard to design. We have a few spaces in our house that we really just knew what we wanted from the very beginning and we’ve gone after that without pause and without really needing to put a lot of extra thought into it. But, honestly, those rooms are few and far between. Generally speaking, a room doesn’t come together quite so easily and we’ve learned that when we attempt to just let a room “come together” over time without a specific plan, we’re left with a space that doesn’t feel quite as finished and beautiful as we know it could. Our bedroom is a perfect example of that – we’ve never had a clear direction for that room and have tried to just let it organically come together…but, uh, it’s not coming together. It needs some help. 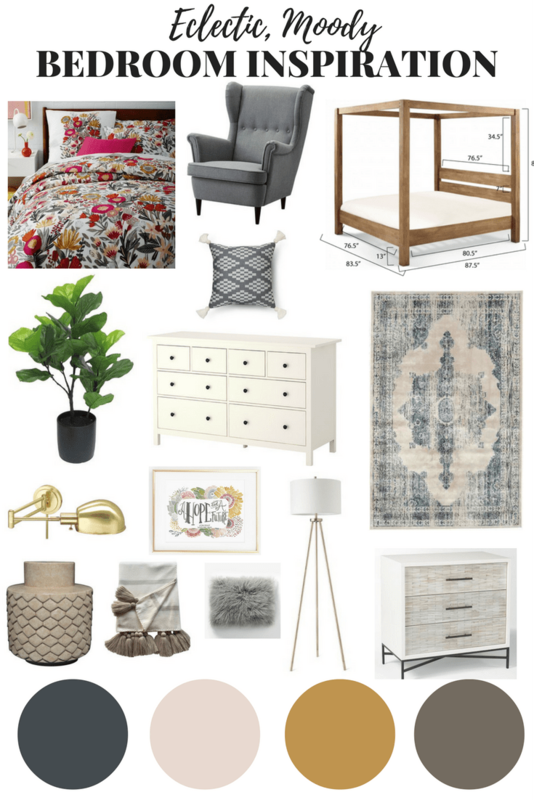 So, I spent some time putting together a plan for the room and now I feel like I have a very clear direction, I know what to do, and I won’t buy or make anything for the room that doesn’t fit into the plan. Secondly, just because I’m good at visualizing things doesn’t mean everyone is. Corey and I go back and forth on design plans a lot, and often he disagrees with a suggestion I make because he has a hard time visualizing it – to him, it doesn’t sound right and he can’t imagine how it would look good, even though I know it would look great. No matter how compelling and wonderful my verbal descriptions of my plans are (hah! ), Corey just has a hard time picturing things without some sort of extra visual. I’ve noticed that since I started putting together mood boards and communicating my ideas with him that way, we get a lot further a lot faster. He can specifically tell me what he does and doesn’t like about a design, I can adjust my plans accordingly, and we’re both happy. Without mood boards and specific plans for rooms we often both feel frustrated because neither one of us feels fully heard and understood – but when we make a mood board we’re able to actually collaborate and come up with a plan we both love! Now, I know what you’re thinking. Mood boards might be great and all but you’re no graphic designer, right? I get it. I thought the same thing at first too. But, y’all, it’s so simple to create them! I like to use a website called Canva to create most of my graphics and mood boards. 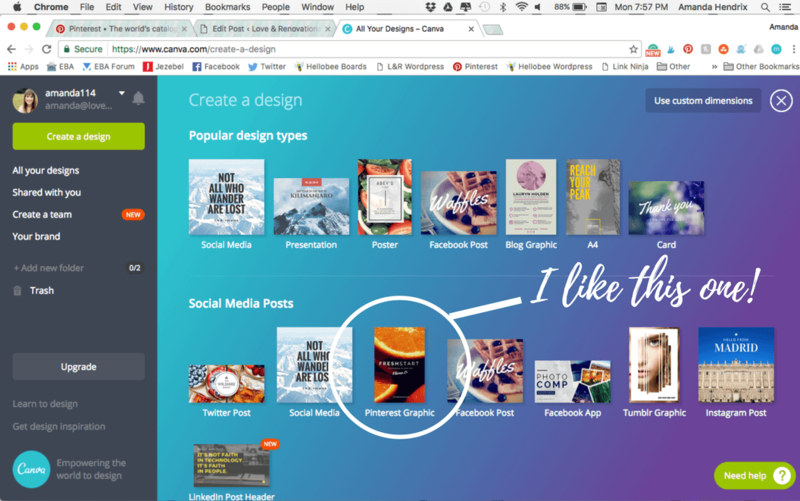 There are other options (like PicMonkey) but Canva feels much more intuitive and easy to use for me. It’s all a matter of personal preference, though, and the directions are mostly the same no matter which site you use! First up, you’ll need to gather your images. I like to stick mostly to product images (so I know that the finished product will be representative of what my room will actually look like, rather than just inspiration) but you can use whatever you want. I like to save all of the images to a specific folder on my laptop so they’re easy to find, then just drop ’em all into Canva. 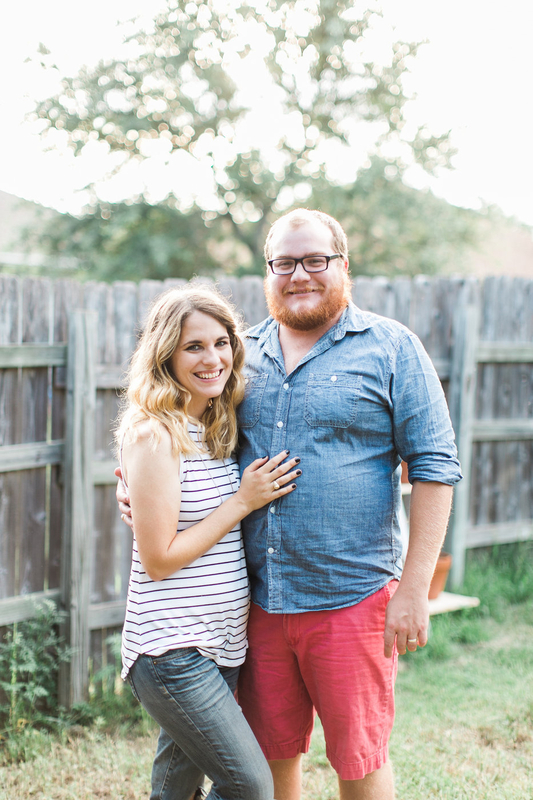 Head to Canva to get started. The basic program is totally free to use, but you can purchase graphics for about $1 each – I use this website multiple times a week and have never paid a penny, though! You’ll see a bunch of options for sizes – I usually hit “more” and choose the “Pinterest graphic” image. Obviously, I want my images to be optimized for Pinterest, but it’s also just a really good size for the mood boards! A new window will pop up with your design – click “uploads” on the left-hand sidebar, and upload your inspiration images. Once you’ve got them uploaded, you can simply drag and drop them onto the board, then resize and arrange them to fit. Once I have all of my product images in I like to add a color palette for the room, especially if I don’t already have a super clear direction for it. For example, with our bedroom I have always struggled to really nail down exactly what I want. I added in colors to the mood board so that as I start working towards purchasing things and making decisions for the room I have a clear guideline for what to do. However, in Jackson’s room I already had a really clear picture in my head of what I want to do and composed the mood board mostly as a way to communicate my vision with you guys – not necessarily because I needed it for myself. To add the colors, all I did was click “elements” on the sidebar, then chose a circle. I added four of them and then changed the colors to fit with the colors for our room. How did I decide on the colors? Well, the color on the far left is the paint color we plan on doing in the room (Benjamin Moore’s Hale Navy), and I got the other three colors directly from our duvet cover! It’s really easy to pick out colors from a photo – just go to a website that can tell you the hex codes from an image (I like this one), upload your photo, and choose the part of the image you want to draw the color from. With this method, I can ensure that the colors I choose for the room coordinate nicely with the elements we already have, but I made sure to choose darker and moodier colors from the bedding (rather than the really colorful ones) to help tone down some of the brightness of the duvet. Once you’ve got your hex code, you can just click the “+” on the color picker and type it in – perfect match! Then, all that’s left to do is add a cute title with the “text” tab and download your image (by clicking “download” up in the top right corner). It’s that easy! Once I’ve got all of your images downloaded it takes me maybe 20 minutes from start to finish, depending on how picky I am with the layout. And the finished result? 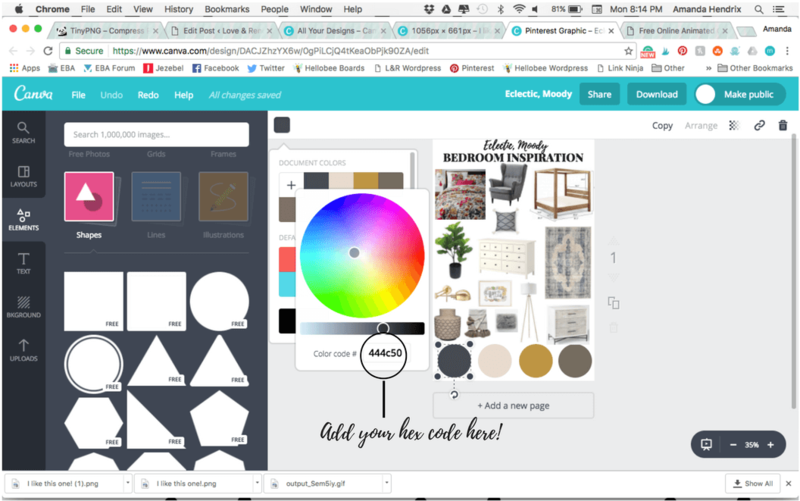 It’s the perfect way to help you stay on track when you’re designing your room! Now, go forth and create a mood board! I’d love to see what you design if you decide to give it a shot – I promise, it’ll make a lot of your design dilemmas seem a lot less stressful when you just get all of the elements laid out together. You can easily see what works and what sticks out like a sore thumb, and adjust your plans accordingly. It’s a game changer, y’all! What room in your house do you need to create a mood board for? Thank you SO MUCH for this! I have always thought that your graphics pulled your articles together in such a gorgeous way. To have a step by step tutorial is a dream, especially for someone just getting into blogging and having very little knowledge about the background work! Of course! Glad it’s helpful! I was literally going to google how to do this today, but for other inspirations (Easter, birthday parties, showers). Thank you! Glad it helped! It’s so, so easy! Ahh, this is what I’ve been looking for! Thank you! Also, love the mood board, especially the sconce. Where is it from? Thanks!! Yay! Glad it helped! And I meant to include the sources for that mood board – thanks for pointing that out! Here’s the link for the sconce!